Annotation of the Collison Bay night-time, low tide excavations. 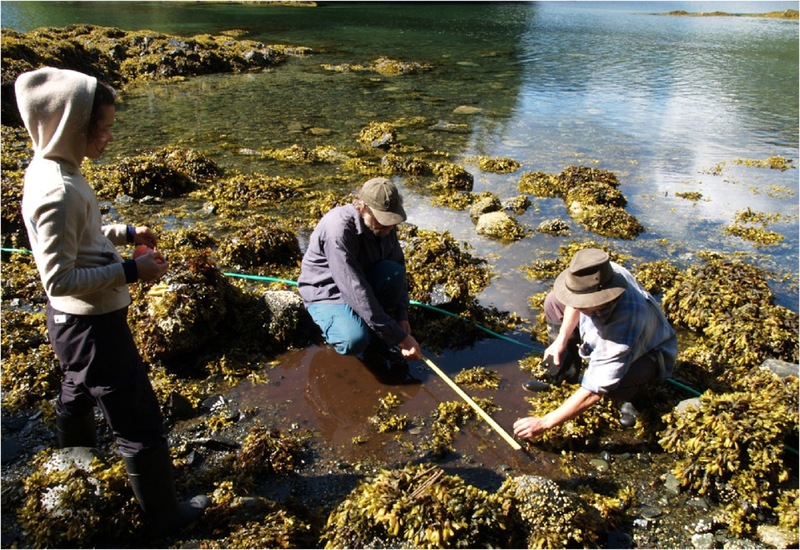 The Collison Bay site in Haida Gwaii posed some unusual challenges, some natural and others of our own making. The site is found in the intertidal zone and dates, like the Kilgii Gwaay site about 10 km away, to a brief window about 10,700 calendar years ago. I posted the above picture before, but without annotation. That previous post describes something of the site formation processes, which mean a site which was terrestrial when occupied is now in the intertidal zone, and excavation must take place between the tides. Looking at the above, you can see we didn’t plan for the tides very well! other projects required us to be elsewhere and when it was Collison Bay’s turn, the low tides were in the middle of the night. This meant we had to get up at midnight to work until about 6.00 in the morning the first night to catch the falling tide, then we got up about 12.45, then about 1.30, and so on: tracking the procession of the low tides. 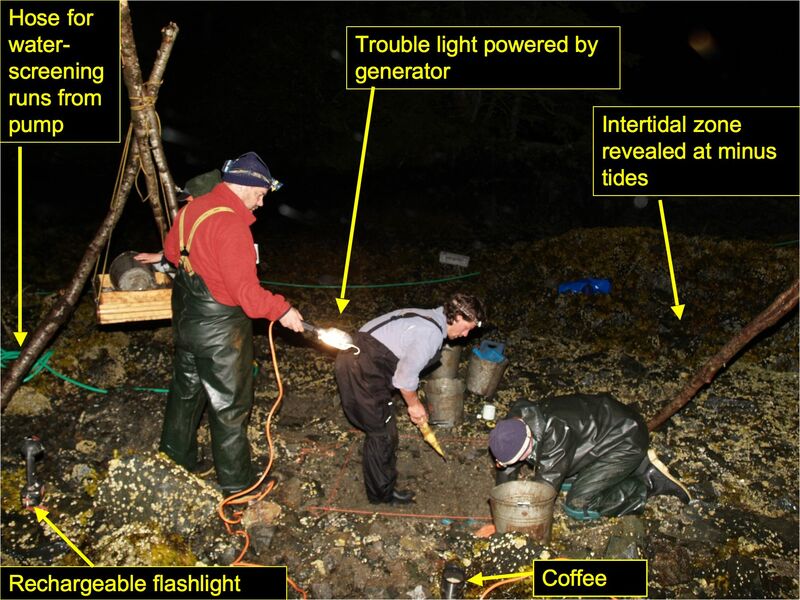 So, to the inherent complications of working in the intertidal zone we did it in the dark, running electric lights from a generator. This actually worked really well and data recovery was excellent – we dug there on another occasion in the daytime (see below) and there was no real difference in quality of work. Also part way through this project we were working until mid-morning and could see pretty well! The site includes numerous water-worn stone tools on the surface and in the upper beach deposits, but in the lower beach deposits the tools are pristine and show no signs of water-rolling. In many cases they lie flat, also suggesting a lack of disturbance, and they are encased in a thin, brown layer of jelly-like material which is the organic remains of a degraded soil. Unlike at Kilgii Gwaay, there is no survival of bone or wood. 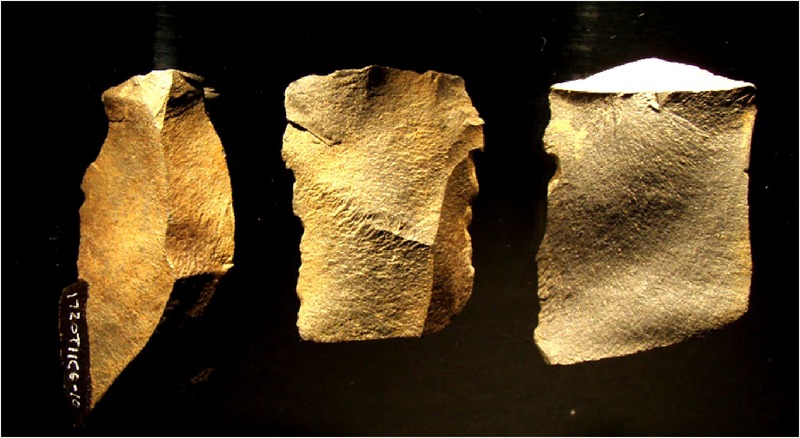 Nonetheless, the stone tools are very similar to that site, and speak to a terminal Pleistocene technological approach using discoidal and uni-directional cores to create large blade-like flakes. Too much information for some readers I bet – but the take home message is this way of making stone tools might be peculiar to the Pacific Rim and not the continental interior and therefore might, perhaps, maybe, one day, turn out to have significance for the coastal route of the First Peopling of the Americas. Establishing an excavation unit as soon as feasible on a falling tide to maximize digging window. This entry was posted in Archaeology, fieldwork, Haida Gwaii, Northwest Coast and tagged annotation, Collison Bay, Gwaii Haanas, Haida Gwaii, Intertidal, Kilgii Gwaay, lithics, stone tools. Bookmark the permalink. Nice blade like flake photo! Q: Why do you think this approach was used? i.e. what were these tools needed for at this time?? Is that use wear or..? I think they wanted large, regular flakes for a unifacial technology. At Kilgii and Collison there is essentially no bifacial technology, and Kilgii is a summertime site. So part of the year they seem to do ok with no bifaces — subbing in bone tools instead I suspect. Then, you need big unifacial knives, and you need unifaces for the bone and woodwork, which we have numerous examples of. At Richardson, a wintertime spot, we have tons of bifaces (preusmably related to winter bear hunting) but also a strong discoidal/unifacial/unidirectional assemblage — so it seems that, perhaps (all very guessy) that the unifacial assemblage is the core assemblage, to which bifaces are added as usual. I know the projectile point sociologists won’t like that, but hey.